Clean smaller spaces with speed and precision! The Daytona Speed Master Jr. Wheel Brush gives you unparalleled access to clean the tight spaces of your vehicle, like narrow wheel spokes and the grill. The flexible, compact brush goes where no other wheel brush can fit! 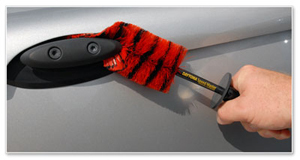 Use the Daytona Speed Master Jr. Wheel Brush on your vehicle, motorcycle, bicycle, or ATV. Do you have very narrow spoke wheels, an intricate wheel design or a hard-to-clean front grill? A regular spoke wheel brush or detailing brush can't always fit between the narrowest features on your vehicle, and these ordinary brushes certainly can't flex. But the Daytona Speed Master Jr. Wheel Brush can! Soft, nonabrasive 2 inch bristles. Whether the wheels are aluminum or clear coated, they can be scratched by the wrong brush. 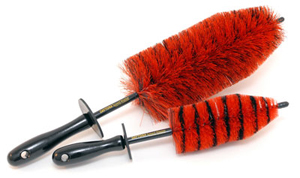 The Daytona Speed Master Jr. Wheel Brush features nylon Nylex bristles that are both flexible and durable. 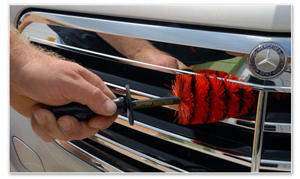 The end of each bristle is feathered to provide an extra gentle touch on delicate wheel finishes. Use the Daytona Speed Master Jr. Wheel Brush on highly polished aluminum, chrome, stainless, clear coated, and painted wheels with confidence. The Daytona Speed Master Jr. cleans between grill slats of varying widths. Patented memory bristles regain their shape. 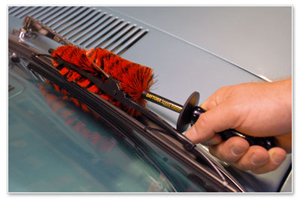 Detail brushes can lose their shape and their functionality over time because they’re pressed into the grooves and crevices of your car. The Daytona Speed Master Jr. Wheel Brush has special memory bristles that regain their shape after every use. Simply rinse the brush in hot water and hang it upside down to dry. The bristles will settle back into their original shape, just like new. Memory bristles allow the Daytona Speed Master Jr. Wheel Brush to remain effective when other brushes fall short. Chemical resistant. The Daytona Speed Master Jr. Wheel Brush’s synthetic bristles can withstand all wheel cleaners and degreasers, even powerful aluminum wheel cleaners. Whereas natural bristles can eventually become dry and brittle, the bristles on the Daytona Speed Master Jr. Wheel Brush stay smooth, soft, and flexible. Use the Daytona Speed Master Jr. to remove dirt from the air intake vent. Fits all wheel designs. The Daytona Speed Master Jr. Wheel Brush may look like a big brush, but it fits in the smallest spaces. Clean between wire spokes and even between the brake caliper and the wheel! The flexible bristles easily fold against the stem to a ½ inch thickness. When you’re finished cleaning the wheels, rinse the Daytona Speed Master Jr. Wheel Brush in hot water and hang to dry to restore the brush’s original shape. The Daytona Speed Master Jr. is safe on chrome, painted, clear coated, and plated surfaces. Reinforced, flexible stem. Many of today’s wheel designs give you full visibility through the wheel. Brake dust literally has nowhere to hide! The Daytona Speed Master Jr. Wheel Brush is the solution. The upgraded, vinyl-coated wire stem flexes to reach all the way through the wheel to clean the edge on the other side! The 9 inch stem is of a heavier gauge wire to give it flexibility and stability. The vinyl coating protects the wheel from scratching. In fact, if you pull the bristles apart, you can see that the wire is completely covered for the entire length of the brush. Safe bonded tip. The tip of the Daytona Speed Master Jr. Wheel Brush is coated in vinyl to protect the wheel from contact. No part of the internal wire stem is visible so there’s no chance of it scratching the wheel as long as the bonded tip stays in tact. Cleans the engine bay, too. The Daytona Speed Master Jr. Wheel Brush is a phenomenal wheel brush, but it also works great under the hood. The flexible, synthetic bristles, long stem, and go-anywhere design all make it ideal for cleaning between engine components. You can use the Daytona Speed Master Jr. Wheel Brush on chrome, aluminum, and custom engines. It will not scratch! We highly recommend using a second Daytona Speed Master Jr. Wheel Brush for the engine to avoid cross-contamination between the wheels and engine. Thanks to its small size, the Daytona Speed Master Jr. Wheel Brush is ideal for motorcycles! Clean around pipes, forks, and everywhere in between without scratching. After every use, take a moment to wash the oil and grease from the Daytona Speed Master Jr. Wheel Brush. 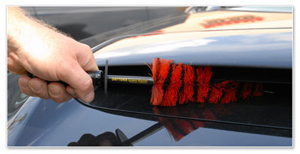 You’ll have a clean brush the next time you’re ready to detail. This also gives you the opportunity to rinse the brush in hot water and hang it to dry to reshape the bristles. 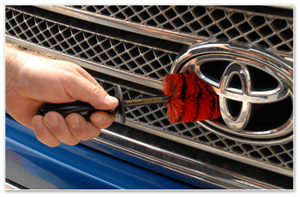 Brake dust can go anywhere – your wheel brush should be able to as well. The Daytona Speed Master Jr. Wheel Brush fits where other brushes can’t to thoroughly clean the most intricate wheel designs, grills, and motorcycles. The synthetic memory bristles are safe on all wheel finishes, and the brush regains its shape after use. The Daytona Speed Master Jr. Wheel Brush is the ultimate detail brush for all wheels, including high performance, alloy, spoke, wire spoke, metal, and coated wheels!